We now turn our attention to inventory systems which can be modeled as a multistage game with probability criterion. Problems of this genre were studied by Liu. 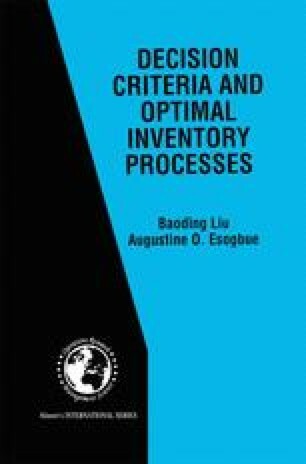 In this chapter, we will restrict our attention to the maximin ordering policy of probability criterion models for inventory systems in which we maximize the minimum weighted sum of all probabilities that the inventory levels over their respective stages do not exceed some specified bounds α and β for all demands. These demands are assumed to be independently stochastic variables that have known mean (µ) and standard deviation (σ), but their distributions are otherwise arbitrary and may change from stage to stage. We show that if α−β ≤ 2σ, then the inventory system is always wrong when the worst distribution of demand occurs; if α − β < 2σ, then the stock level µ + 1/2 (α + β) is guaranteed against all distributions with mean µ and standard deviation σ when the initial inventory level is less than u + 1/2(α + β). We also prove that the minimizing (or worst) distribution is a two-point or three-point distribution which is represented by some explicit forms.